Upgrade your Toothbrush: If you’re still using a manual toothbrush, it may be time to upgrade to an electronic one. Studies have shown that electronic toothbrushes are several times more effective at removing plaque, stuck food and other debris. This leads to a reduction of gingivitis as compared to a manual toothbrush! When selecting the right electronic toothbrush for you, look for one that has the right balance of cost and features for you. Some come with timers and sensors, but those are not necessary. Just make sure that you are brushing for a full two minutes at medium pressure. If you already have an electronic toothbrush and are interested, there are several water cleansing systems and sonic systems available. 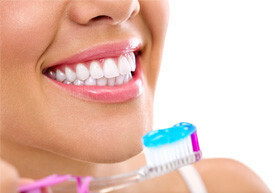 Be Thorough: Most people honestly only brush the fronts and backs of their teeth. When it comes to Spring cleaning, you will need to do more. Take the time to brush the fronts and backs of the teeth as well as the tongue, cheeks and roof of your mouth. You may find it helpful to use a mouthwash that tints plaque buildup. That may help you spot areas you may have been missing and not realized it. Make sure you are gentle when brushing the roof of your mouth, as this area can easily be rubbed raw. Take Time for the Tongue: Bacteria can, and will, hide in any crack or crevice in your mouth. Most people spend so much time brushing and flossing their teeth that they forget there is another large bacteria prone area right behind them. Take a look at your tongue in the mirror. Every one of those little nooks and ridges is a possible hiding place for microbes that can cause bad breath and oral disease if not taken care of. If you don’t have a tongue scraper, you should invest! Using one is actually pretty simple. Begin with a rinse and then gently brush the top of the tongue. Some tongue scrapers come with a brush attached to them for this reason. Next, scrape your tongue from back to front, getting as far back as you can. Those of you with sensitive gag reflexes may struggle with this at first. Do this a few times and then spit. Finish up with another rinse. Get Gummy: Take a good long look at your gums. The gumline is one of the places that plaque and tartar build up and begin to harden. You will be able to see these deposits easily in a lit magnified mirror. Scrape them away gently using a dental scraper (most stores carry them). Some of these deposits will be very stubborn. Do NOT continue scraping if you are unable to remove them easily. These deposits will need to be cleaned away professionally in our office. Attempting to remove them yourself can lead to further disease and infection. Bonus Tip: Drink More Water! Soda, coffee, tea and wine can all stain your teeth. Juice is a slightly better option but the sugar can eat away at the enamel. If you do choose to drink any of these things, drink a glass of water along with it to help avoid damage to your teeth.